Pure experience: come with us into the fascinating world of sleddogs! Upon the arrival you are shown to your cosy accomodation.. Check out the place, unpack and make yourselves at home. talk about the days ahead of us. We start the day with an informative pre-tour introduction and instruction into Dog Sledding with competent, friendly, bilingual instructors. Here you can be active from the time you arrive until the time you leave. and help with the necessary chores at the camp. 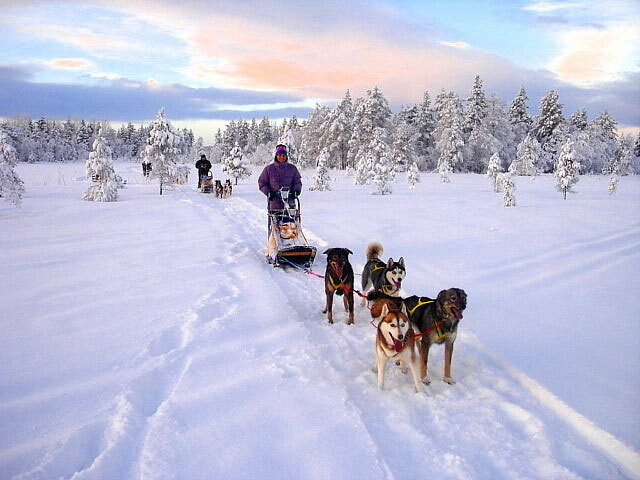 Then we start off on our first sleddogtrip, the tour is about 20 km through the surrounding forests. After a delicious scandinavian dinner we are happy to round off the evening with a visit to the sauna. A guide will help you if you want. 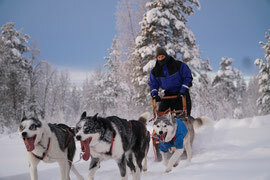 During the tours you will learn the basics of husky sled-driving and learn to know the character of "your" huskies. 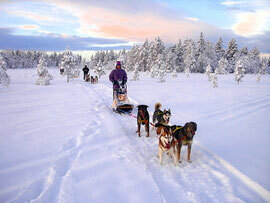 broken only by the breathing of the sleddogs and the sound of crackling snow beneath your feet. Depending on ability and desire of the participants, the daily tours will be between 25km and 40km long. Back at the farm you can enjoy the sauna or a campfire. We can spent one night outside in the wilderness in a romantic cabin. The cabin has no electricity and no water. The guests can choose if they want to do this. Today is a rest day for our four-legged friends. if they prefer ice fishing . we can smoke or cook them over an open fire in the evening. Maybe take a dip in HOTPOT (Bubblepool). The last day is, unfortunately, the day of departure. After breakfast you will say goodbye to the dogs and then transfer to the airport. Good health and level of fitness. 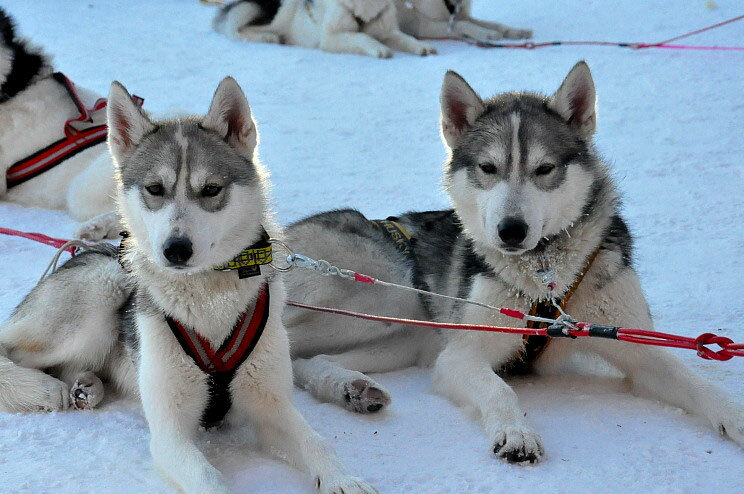 Previous experience of dog sledding and winter camping.